This past weekend, I made this festive Peppermint White Russian cocktail for a small dinner party we hosted. I set up a little photo booth with my instant camera, and crafted a smaller shot version of the drink. It and the Photo Booth were big hits. Those pictures will never see this blog. The drink though might be on repeat for the rest of the holiday season. Grandma would always make herself a little Kahlua and milk, or White Russian when she entertained. I remember when I first tasted one of her drinks it reminded me of a chocolate milk with a little bit of a kick. Who doesn't like that? Well I liked them so much that when I was in college and we happened to come across an establishment that one might be listening to some good music, dancing and enjoying a refreshing beverage or two - you work up such a thirst dancing - the words White Russian would just pop out of my mouth. So every time I take a little sip of one it reminds me a little of my youth, and some sweet memories. Which totally wasn't that long ago since I'm twenty-two and all. 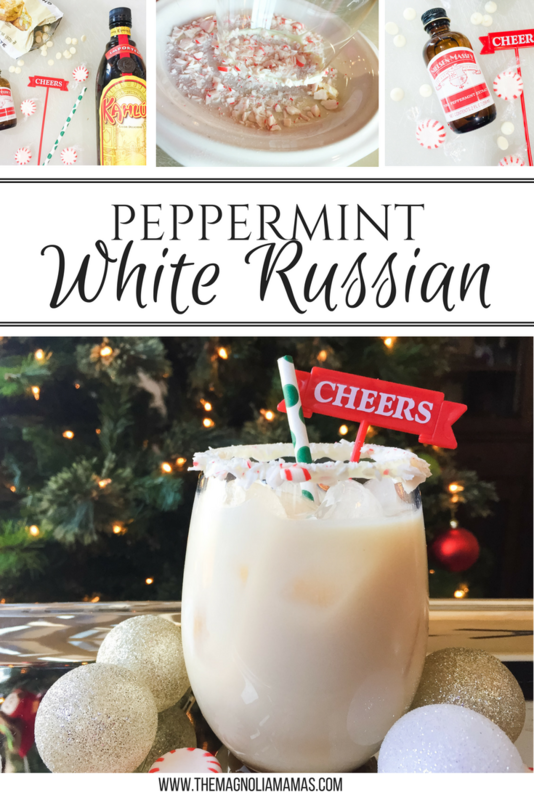 So remind yourself of my youth too, and make this festive drink this holiday season. Your holiday guests and future college selves will be thanking you everywhere. 1. Crush peppermints or candy canes until they are in fine pieces. Set aside. 2. Place white chocolate in a microwaveable bowl and microwave in increments of 30 seconds until fully melted. 3. Dip rim of glass into melted white chocolate and then dip into crushed peppermint. 4. Add ice to glass. 5. Pour Kahlua, vodka, and peppermint extract over ice. 6. Add milk and then lightly stir.